When people retire to Mesa, they usually have heard about Mesa from a friend...one who lives there or has spent winters there. 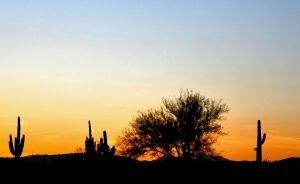 It is becoming a very popular place to retire in Arizona, especially those folks on a budget... your Arizona retirement dollar goes a long way in Mesa. Mesa is home to several large Park model/RV communities...lots of the residents are snowbirds...some live here year-round. They are most joyful when Easter comes around and the stores, restaurants and streets become relatively deserted compared to Jan- Mar. Mesa is 20 miles due east of downtown Phoenix...in between is trendy Scottsdale, and Tempe the home of Arizona State University. Mesa has a population of almost 500,000 people. According to a study made by Arizona State in 2003, upwards of 300,000 snowbirds come to Mesa in the wintertime. The Chicago Cubs have made Mesa their home for spring training for many winters...many of the snowbirds are diehard Cubs fans, who are loyal like no other...in 2016 their patience was rewarded. Within 25 miles of Mesa, you can see the Arizona Diamondbacks of the National League, the Arizona Cardinals of the NFL, the Arizona Coyotes of the NHL,the Phoenix Suns of the NBA, as well as root for the Arizona State Sun Devils. The local PGA Tour stop, the Phoenix open (aka the FBR open and the Waste Management open), draws more fans four days that any other golf tournament on the PGA Tour... Close to half 1 million golf fans watch the festivities during the four-day event in February. Mesa is bordered on the east by the Superstition Mountains, the supposedly home of the Lost Dutchman mine. You may not find any gold, lots have tried unsuccessfully, but you will find that the Superstition offers some of the best hiking in the area. My favorite hike in the area is the one to Weaver's Needle. Ranging in size 200 units to well over 2000 units... This is the primary draw for folks to retire in Mesa. They come from all over, and you probably heard from a friend back in cold country about the activities and the fun they have when they get here. Some have golf courses, all have pools usually more than one, and it is not uncommon for the large communities to have over 100 interest groups or clubs... If you can't find something to do when you retire to Mesa... Is most probably your fault.